This charming apartment is part of a magnificent tower from the year 1000, the tower has long served as a watchtower for the Florentine army. The tower and adjacent area were during the restoration converted into 5 apartments and a residence for the owner. The attractive interior and distinctive details such as wood-beamed ceilings and terracotta floors make this a very cozy apartment. The apartment has an own terrace space so you can enjoy sitting outdoors. With the other residents you share a large garden, a swimming pool with stunning view, and a barbecue. 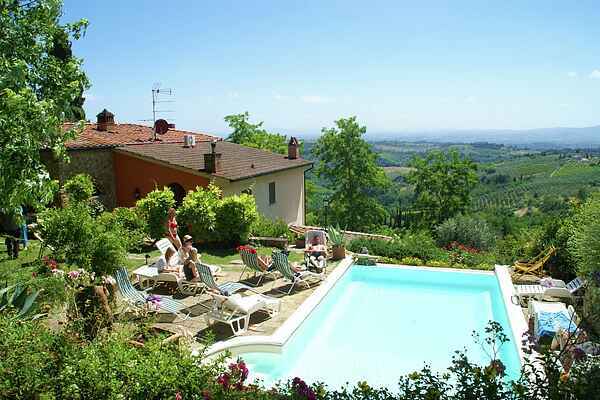 You are here in the beautiful Chianti region with splendid panoramic views of the hilly landscape. Only one kilometre away is the charming village of Tavarnelle Val di Pesa, here you can find your daily groceries but you can also enjoy a bite to eat. The place is surrounded by picturesque villages, beautiful cities and stunning views. Highly recommended are visits to cities such as Greve in Chianti (24 km) Castelfiorentino (26 km), Florence (30 km) and Siena (40 km). Each one of them beautiful historic towns.